Safety and Strength: If you have ever played basketball in the pool, especially with or as a teenager, you know that the games can get rough. There are no referees in pool basketball. It is fight and claw to get to the basketball hoop and jump over someone’s head to slam it. 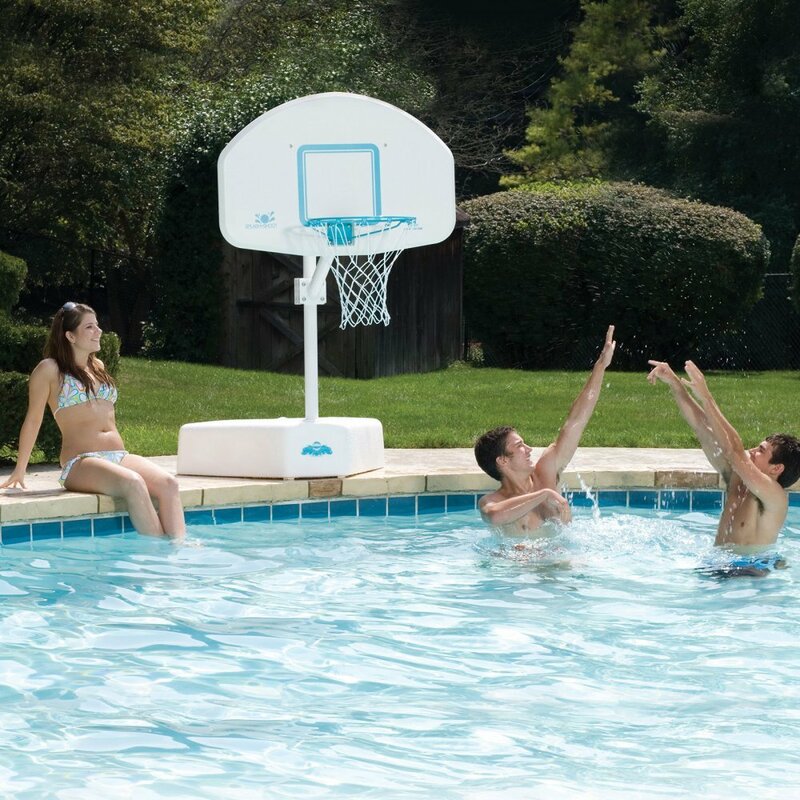 You are lucky if the hoop doesn’t fall into the pool, crushing down on an innocent player (or bench sitter). So with these reviews, we will consider the safety, durability and construction of the hoop. Rust Protection: No secret that you pool basketball hoop is going to be around water. You don’t want your hoop to rust out over a year and spill the rust stain all over your pool deck and into your pool. It also becomes a safety issue when you have rust in and around a pool and hoop. So let’s make sure you find yourself a basketball hoop that isn’t going to rust away. Assembly: If you are like me, assembling things is not your strong suit. I love to play ball, but I dread setting up a basketball hoop. With a pool hoop, you want something you can set up yourself without much time going into it. Look: What? 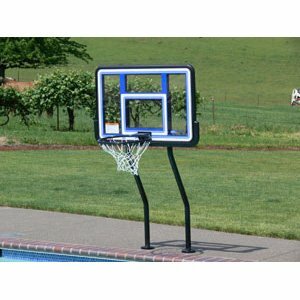 You need a cool looking hoop to set up beside your pool. It is mandatory. You spent way too much on a house with a pool to put a doinker hoop that is ugly next to it. I will help you find a good looking hoop. Strong Rim: This goes along with #1 (Safety and Strength), however, it is a little bit different. Hoops and rims are two separate things. Let’s make sure you get a good sturdy rim to go along with your nice hoop. 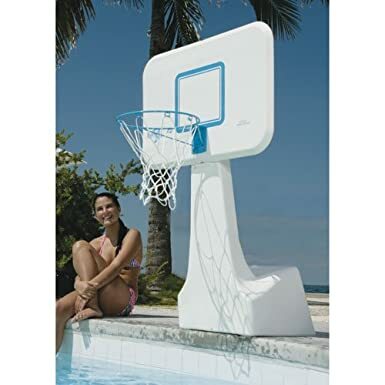 It is cake to assemble – It is strong, durable and will last through rough play – Well balanced with a large enough rim (14inch) to fit a regulation sized ball – comes with its own matching basketball – Looks good and overhangs the pool nicely. Rust issue: There are certain reviews with this hoop that say that the rust is overwhelming and bleeds into the pool. Other reviewers say that rust is not a problem and that it was addressed with new stainless steel hardware. Some say the rust comes from the rim. What can I say. Splash and Shoot takes over #1 and #2. They just make the best pool side hoops, no doubt about it. This hoop is regulation size which may or may not be what you are looking for. I personally prefer it. But I don’t prefer to use a regulation ball. Big hoop small ball makes for a lot more made three pointers which is what I shoot. I quit dunking after I separated my shoulder. Assembly is easy, no problem. There is one reviewer that said there was some missing hardware and they had to go to the store and buy it separately. There aren’t any complaints of rusting or durability issues. It is certainly a strong pool hoop that is great for teenagers. Once again, not in love with the baby blue but it looks get next to the pool. 5 Star Pool Hoop! This is an interesting pick at #3. Definitely not conventional. The S.R. 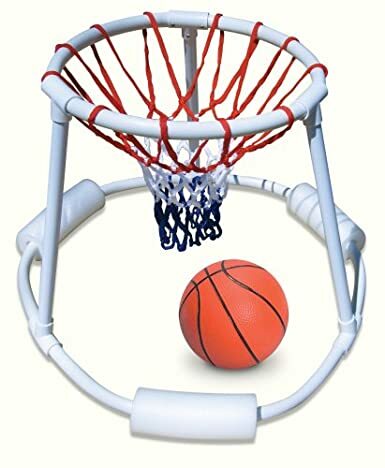 Smith Basketball hoop is new to Amazon and doesn’t have any user reviews. If you go their website you can read the product details. It is heavy at 46 lbs. 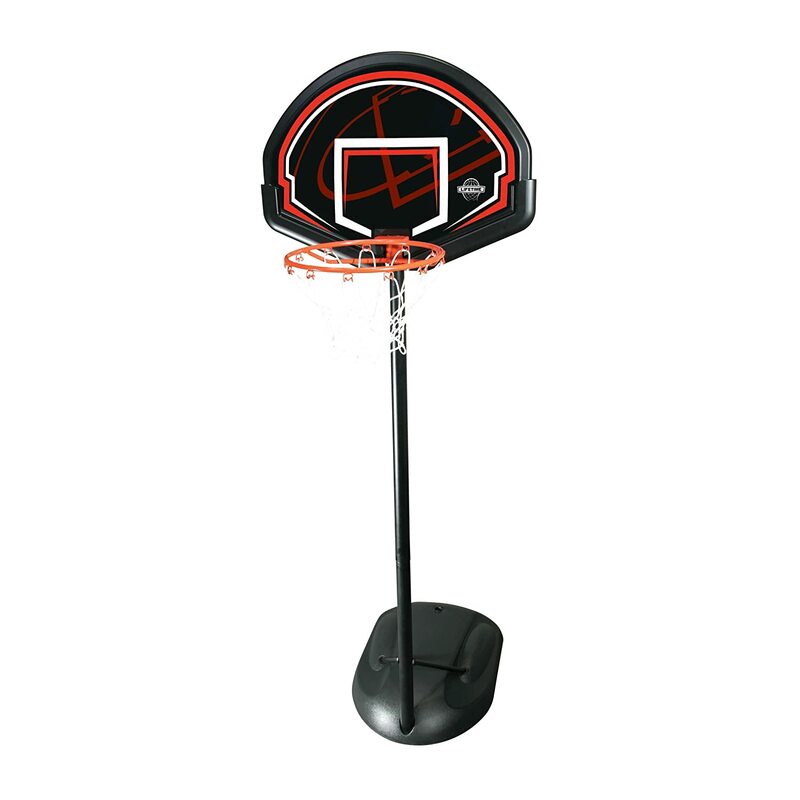 Based on the Product Specifications that you can read here, it looks to be a sturdy and strong hoop with heavy uprights and anchors and a safety pad under the backboard. Instillation: Click Here for Installation Instructions and details. This thing is not as easy as the others to install. It is definitely a more comprehensive install. NOTE: Two in-deck plastic anchors (AS-100P) for concrete decks are required to install the game. You have to install the anchors with the concrete. So if you haven’t done this already, than this is not for you. This is a hoop that you should get if you are installing a pool now. THESE HOOPS ARE SPECIALLY DESIGNED FOR SALT POOLS. I think Lifetime makes Great Basketball hoops. I especially like their kids hoops. I may not be doing this hoop justice at #4. It would really be a tough decision between the top four. It would be nice to anchor a hoop into the cement if you have the opportunity. However, if you are going with portable pool hoop, this lifetimes 1306 is a great option. Installation is not terribly difficult, with an estimated start to finish time of 1 hour. It comes with a nice rim and net and the product is heavy duty. Some users say that if you call the company they will send you a new net every 2-3 years or when necessary. The only major issue that I can see in this hoop is rusting. IF you have a salt pool, you may want to think twice about buying this hoop. There will be rust issues. With a non-salt pool it still may have rust issues where the angle meets the pole and with the rim. Still, definitely a good alternative and worth considering. This lifetime pool hoop is also well built, sturdy and looks good. No question about it. It is a fun hoop. It is a little more difficult to assemble as some of the parts look similar and there doesn’t appear to be labels on the parts. There are definite rust issues with this hoop. The problem appears to be coming from the hardware bolts. Other than the rust issue, this is a very well designed pool hoop. At 24 pounds it is not the heaviest of the pool hoops, but I do think it is a good one. Smaller 14′ hoop for play with a smaller ball. Hard plastic backboard. There is one reviewer that had problems with the design. The other reviewers seem to really enjoy it. Okay fine, I will admit along with the reviewers that this is not the most sturdy pool hoop on the market. You are not going to go crazy with a dunk ball pool game. However, this hoop does have a market for pool hoops. We used to use one of these things. Put it in the shallow end and jump off of the diving board and throw the basketball in the hoop. Very difficult to make it. First to 5 makes wins. I enjoyed it at least. None. Unless you are looking for a hoop for older children. Are you looking for an outdoor basketball hoop for your young children? Maybe your children are too old for their indoor plastic basketball hoop system and you are ready for an upgrade. Or maybe, you just want to get your children outside so they quit breaking everything in your house. The Lifetime Youth Portable Basketball system is perfect for children, I would say under 8 years old. 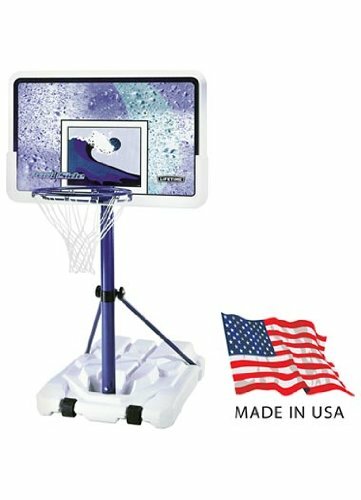 It adjusts from 5.5 feet to 7.5 feet, which gives your children something to dunk on and feel like they are really playing on. The Rim Size is smaller than regulation (15′) and is better with a junior basketball. Preferred over the SKLZ Mini basketball Hoop System. Easy assembly. Alot easier than most portable systems. Durable. It is built well. Sturdy and durable for a children’s outdoor hoop. High Amazon User Reviews. Don’t just take it from us. This is a highly rated youth outdoor basketball hoop system. Easy Adjustment You don’t need a tool box to adjust the height of this hoop. Only for Young Children This hoop is built for children up to probably eight years old. After that age, you had better get a 10 foot regulation hoop. Not much else. Some say it was tricky to put together. I didn’t find it very difficult at all. Overall, it is a nice beginners hoop. Any family with young children would be happy to get this for Christmas. So, our Lifetime portable basketball hoop has survived the weather well now for three years. This is a photo of the hoop three years after we bought it: There aren’t any defects and our kids still love playing with it. The 1269 is the entry level portable system by Lifetime. It has a 44-inch acrylic backboard and a 27 gallon base that can be filled with water or sand. The height adjusts from 7.5 – 10 feet in 6-inch increments using a telescoping design. It has a classic style rim and a 3-section pole that is 2.75-inches round. The latter is powder coated for protection, and the graphics on the backboard are U-V protected. Lifetime backs the 1269 with a 5-year limited warranty. Inexpensive. The best feature of any entry-level basketball hoop is the price. Systems can cost thousands on the high end. Priced at $179, you won’t have to break the bank. As long as it’s not abused, it should last for as long as you need it do. 5-year warranty. A warranty on an inexpensive hoop is important because it’s naturally not made with parts as strong as more expensive models. The backboard in particular will be more susceptible to cracking or breaking. With a 5-year warranty, you are protected just in case. Reputable brand. Lifetime has been around since 1986, and they produce a long line of basketball hoops. They sell products that can be trusted. Easy to move. It weighs less than 60 pounds, so kids can move it themselves without much trouble. Perfect for young children. 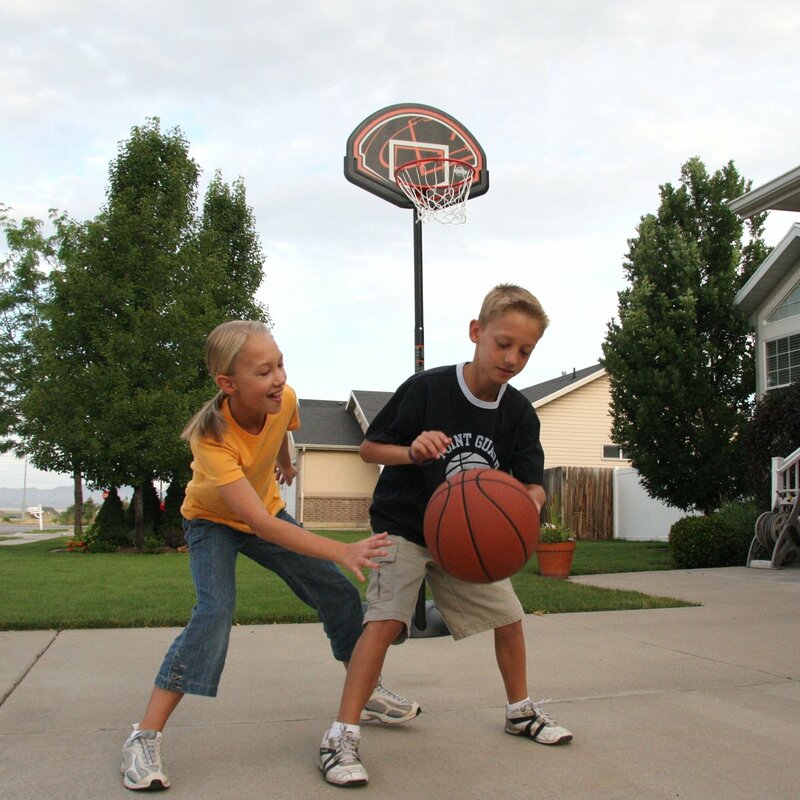 Kids under the age of 10 don’t need a $1000 basketball hoop. It’s perfect for just shooting around and enjoying the outdoors. This hoop isn’t built for rough play, and it doesn’t need to be. It’s not anything fancy, but that’s what makes it appealing. Height adjustment. Not all hoops in this class can adjust, so this is a plus. Children can really benefit from this because it takes awhile before they can realistically begin making shots on a 10 foot hoop. This is particularly ideal for families with children of varying ages. Small backboard. 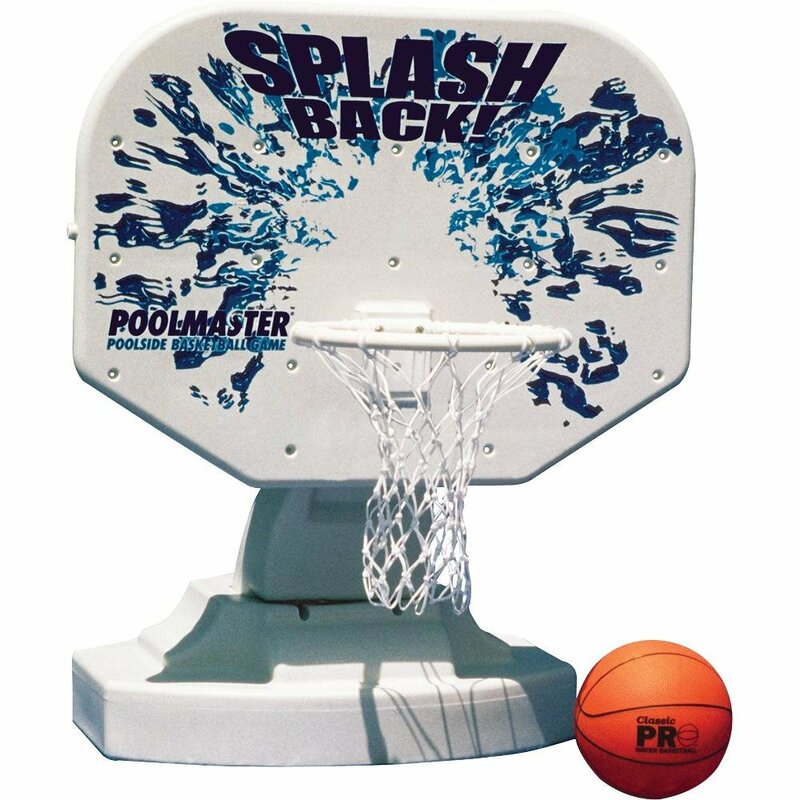 A 44″ backboard is one of the smaller ones that you’ll find for an outdoor hoop. It makes it harder to shoot bank shots, plus it doesn’t give as much of a target. Not sturdy. The hoop will shake quite a bit while shooting on it. It’s not cemented in-ground, the backboard is small and lightweight, and the 3-section pole isn’t sturdy. The ball naturally won’t bounce as well off the backboard. Durability. I have no reason to believe that this hoop won’t last for at least 5 years as long as it’s not abused. But it’s naturally more susceptible to breaking down, particularly the backboard, because the material isn’t as strong. No overhang. This refers to the space between the pole and the backboard. Since the backboard is directly attached to the pole, there is no space for playing under the backboard. Adjustment mechanism. It’s a bit inconvenient, as you really have to tilt the hoop over to do it. You pull a pin out, make the adjustment, the insert the pin back in. Most hoops allow you to adjust it while upright. The Lifetime 1269 is ideal for families who don’t want to invest a lot of money into a hoop for their children. It’s very basic, and functions as it should. The height adjustment is beneficial, and it’s made by a good brand. It’s not as sturdy or durable as some more expensive models, but that’s why it costs less. Overall, it’s a well made hoop, just don’t expect it to last forever.